1. Steel Supports — 3 by 3 by 1/4 in. angles attached at top and bottom with 2 in. long, 3/8 in. diam steel bolts with expansion shields. 2. Steel Flashings — Fabricated from No. 18 MSG painted steel. Side flashings on the liner side are 2 by 3 in. angles with the 3 in. leg attached to the liner units using No. 14 by 1 in. self-tapping steel screws spaced 12 in. OC. Side flashings on the facing unit side are 1-1/2 by 1-1/2 in. angles attached to the facing units with No. 14 by 1 in. self-tapping steel screws spaced 12 in. OC. Top flashing angles on the facing unit side are 2 by 2 in. angles attached to the facing units with No. 14 by 1 in. self-tapping steel screws spaced 12 in. OC. Bottom flashing on the facing units are 2 by 4-1/2 in. angles, placed with the long leg between the sub-girt and the facing unit and held in place by the sub-girt fasteners. 3. Wall and Partition Facing and Accessories*— Steel Liner Units — Normal 12 in. wide by 1-1/2 in. deep. Min gauge No. 20 MSG attached to top and bottom support angles with No. 14 by 1 in. long hex-head self-tapping steel screws with a separate 5/8 in. OD steel washer and a bonded neoprene sealing washer spaced 12 in. OC. Adjacent units fastened together with same type fastener spaced 36 in. OC beginning 3 in. from the top and bottom of each sheet. 4. Reinforcing Channel — No. 18 MSG steel channel 1-1/2 in. deep with 1 in. and 3 in. legs. Used to support the free end of the final liner unit installed. Short leg attached to the liner unit with the same screws used to secure the flashing angle to the liner units. 5. Batts and Blankets* — Nom 12 by 48 by 1-1/2 in. Installed in liner cavity with horizontal joints in adjacent cavities staggered. 6. Sub-girts — Hat-shaped sections, 1/2 in. deep by 2-1/2 in. wide with 3/4 in. legs, fabricated from No. 18 MSG coated steel. Attached at both legs to lips of liner units and to reinforcing channel with No. 14 by 1 in. long hex-head self-tapping steel screws. Spaced 48 in. OC and not more than 3 in. from top and bottom of wall. 7. Gypsum Board* — (Two Layers) — Any 5/8 in. thick UL Classified Gypsum Board that is eligible for use in Design Nos. L501, G512 or U305. Nom 48 in. wide by 5/8 in. thick sheets applied vertically. Joints between layers staggered a min of 12 in. vertically and horizontally. Attached to each sub-girt with No. 6 by 1-5/8 in. long double lead bugle-head self-drilling steel screws spaced 12 in. OC beginning 1-1/2 in. from the horizontal and vertical edges. 7A. Gypsum Board* — (As an alternate to Item 7) — Nom 3/4 in. thick, 48 in. wide, installed as described in Item 7 with length of fasteners for second layer increased to 2-1/4 in. 7B. Gypsum Board* — (As an alternate to Items 7 and 7A) — Nominal 5/8 in. thick, 4 ft wide panels, secured as described in Item 7. 7C. Wall and Partition Facings and Accessories* — (As an alternate to Items 7 through 7B) — Composite Gypsum Panel — Nominal 5/8 in. thick, 4 ft wide panels, secured as described in Item 7. 8. Sub-girts — Same as Item 6. Located in line with the sub-girts on the opposite side and attached through the wallboard to the first set of sub-girts with No. 14 by 3-1/2 in. long hex-head, self-tapping plated steel screws with a separate 5/8 in. OD formed steel washer and a separate neoprene sealing washer spaced 24 in. OC horizontally. 9. Wall and Partition Facings and Accessories*— Steel Facing Units — Nominal 12 to 36 in. wide. Nom 1 in. to 1-1/2 in. deep. Min gauge 20 MS. Attached to sub-girts at side joints with one No. 10 by 1 in. 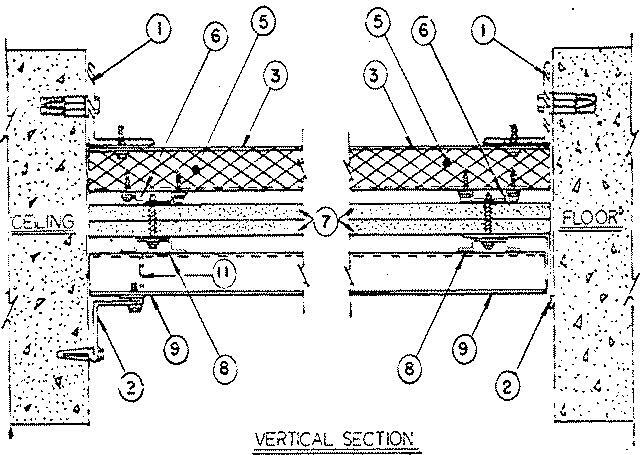 self-drilling, self-tapping hex-head steel screw at each joint attaching adjacent units together. The last unit installed is attached to a reinforcing channel with same screws securing the flashing angle to the facing unit. MORIN CORP — Types A-12-0, A-12-1, A-12-2, B-12, D-12, F-12-0, F-12-1, F-12-2, F-12-S/F-12-SW, J-12-0, J-12-1, J-12-2, K-12-0, K-12-1, K-12-2, L-12-0, L-12-1F, L-12W-1, L-12-2F, 0.24W-PROFILE A, R-12-0, R-12-1, R-12-2, T-12-0, T-12-3, V-12, Y-36-PROFILE A, Y-36-PROFILE B. 10. 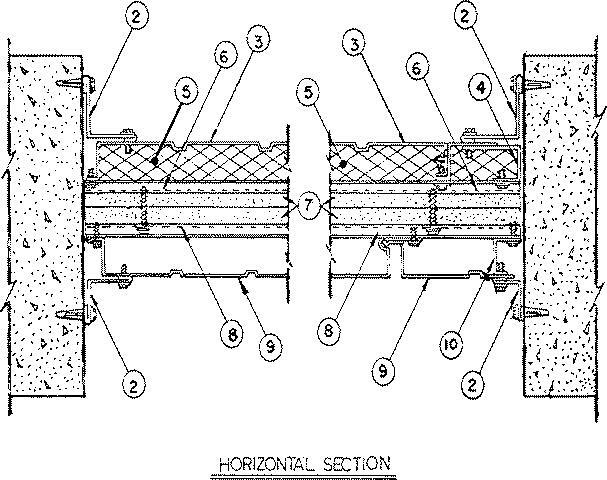 Reinforcing Channel — Channel shaped, 1-1/2 in. deep with 1-1/16 in. and 2-1/8 in. long legs fabricated from No. 18 MSG steel. Used to support the free end of the last facing unit installed. Long leg attached to sub-girts with same type fasteners as those used with the facing units and to the facing units in conjunction with the flashing angles. 11. Closure Angle — Fabricated From No. 18 MSG painted steel. Notched and supplied in lengths to fit contour of facing units. Attached to facing units with No. 14 by 1 in. long self-tapping steel screws spaced 12 in. OC.Clips, Facing Unit — Not shown — Fabricated from No. 18 MSG min gauge galv steel in the shape of an L with 2 by 1-5/8 in. legs. Section holding facing units 3 in. high by 13/16 in. wide with a 5/16 in. leg folded back, attached to sub-girt at each joint with a No. 14 by 1 in. type AB hex-head, self-tapping steel screw.